Another three pages comic has been completed. I love Mycrofy being such a powerful man. I love him for he saying "I've waited a long time to see you again, little brother." You've pulls all the heartstrings. Thank you for a snowy evening well spent. I'm glad I found this, it introduced me to this fanfic, which I read in its entirety last night. This work is even more beautiful now that I have context. Awwww... This is just so cute! What is this salty liquid pouring from my eyes?! How could this beautiful work do such a thing?! thanks for breaking my heart but awesome work! I love the work you put into this! I love your style! 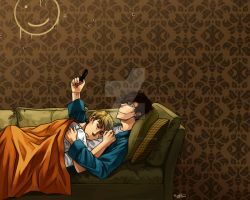 one of the best Johnlock fanfic's I have ever read! and this artwork is fantastically brilliant. it captures the emotions of that charter so well.. so sooo well. I just ;u; uwa <3 Bravo! The brilliance of his face is wonderful. He acts so tough, but he's got a heart, and you've just proved that. I love how the colour just slowly drains out of it as it goes down. It's really effective on the whole heart break thing. i get really sensitive sometimes... i have such a weak heart... i was so close to tears it was that beautiful... awesome work! This is so pregnant! I love it! Just, the art is lovely, and the idea is fantastic, and I want him to reunite with John! OMG.Love it,really.Can't describe howwwwww i love that part of the fic. God Sherlock in this pic makes me want to cry. I FEEL LIKE I HAVE TO REREAD IT!!!! I read that fanfiction because of this piece. You did beautiful justice to it! I LOVE THAT STORY SO MUCH!!!! This makes me cry okay! His expression in the "Don't worry, we'll get his back," BREAKS MY HEART. I love it though!!! I cry every time I read that scene and you have captured it perfectly. Need to go find some paper tissues. I clicked on this picture link as soon as I finished that chapter and just... Could now... Stop... Bawling... Way too emotional right now, pft. But you did a superb job of recapturing this moment. Wonderful work. Could have sworn that I had already favorited this one when I first saw it, like a long time ago. Well, NOW I DID. This is adorable! So very bittersweet! This story was so beautiful, and this drawing captures the moment so perfectly. This is absolutely precious. Absolutely brilliant. I love this so much. Seriously words can no explain how I feel about your art. I love this story!! And what you have done here is beautiful! This scene just breaks my heart!